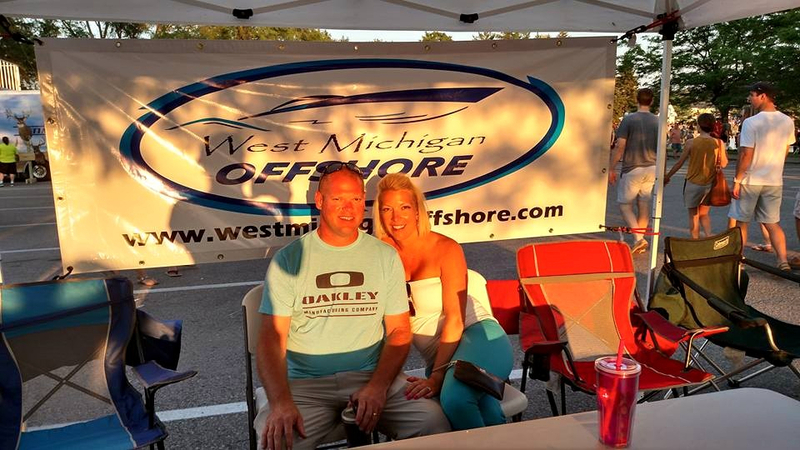 Cheers to Curt Watkins for generously supporting West Michigan Offshore through a sponsorship at the 12th annual Boyne Thunder Poker Run. WMO was represented through a flyer and decal in every driver packet and a sharp-looking display, courtesy of Appearance Products, which was present near the boats. WMO was well-represented through our sponsorship and through dozens of other members participating or hanging out at the run! WMO members Jeff & Angie Brookins hanging out at the display tent! The Kopec family served as a marshall boat at the Northport stop in their 35' Fountain Executioner. Chris Dekker running his 33 Scarab with Wesco Racing 575s. Poker hand could not have been worse: 2, 4, 5, 7, Q.
WMO sponsor Justin Bultsma running in smooth water with Corey Johnson. Derek Powers and Chasity Glavich cruising in their new 37 Active Thunder on Lake Charlevoix. Ben Wiersum piloting Steve Rescola's 36 Apache with Precision Power motors. WMO sponsor (Boostane, Wesco Racing Engines) Dave Wesseldyke's 'Endangered Species' was one of the most attention-getting boats of the run. Curt Watkins had the largest boat at Boyne Thunder - his sleek 52' Skater with Mercury Racing 1350s. Riding with him was WMO sponsors Daniel Martin (Iconic Marketing) and Jon Rooks (The Wharf Marina, Lakehouse Restaurant). Bill and Monica Reiffer showed up in their jaw-dropping 43 Checkmate - another favorite of Boyne Thunder attendees. Steve Niewoonder's 42 Fountain sports a sick paint job by WMO sponsor T&D Custom Painting, in addition to twin 1000s and #6 drives. WMO sponsor Jamie Doss showed off his brand new 34 Saber at Boyne Thunder. It was an attention-getter, and it's for sale! Rick DenBoer piloted this unbelievable 46' Skater with twin 1350s. Webb & Jean Barnes ran their sharp 42' Fountain. Also present was Jason Braun and his 42' Cigarette, 'Loose Canon,' in addition to Carl Hardt's triple outboard 32' Skater cat, Mike Bareman, Adam Fisher, Corey Hoff, Ryan Vogelheim, Jared Bickford, Jeff Farquhorson, Jeff and Terry Breimayer, and many others! Photos courtesy of WMO supporter and friend Bob Barnhardt.